I’ve been using a really firm J Fit foam roller for quite some time now. As I wrote about in this post, using a foam roller is a critically useful tool for increasing blood flow and circulation to your muscles and tissues to promote healing. They can also provide “myofascial release”, which is a technique that results in softening and lengthening of the fascia over your muscles. By focusing the roller on places where you are stiff, sore, or are experiencing reduced flexibility; you can break down unwanted adhesions between the fascia and the underlying muscle tissue. At first the foam roller was pretty painful. But after using it for awhile, I’m used to it and it takes a lot more pressure to work on the knots in my muscles. So I was ready to take it to the next level with a new roller that I heard about called the “RumbleRoller“. 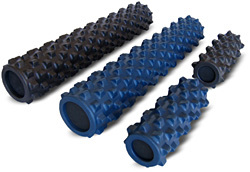 It is basically a foam roller that is covered with specially designed bumps that are firm, but flexible, much like the thumbs of a massage therapist. As you roll over the RumbleRoller, the bumps continuously knead the contours of your body, gently stretching soft tissue (muscle and fascia) in multiple directions. This action hits trigger points, helps restore flexibility, and brings quick relief to common types of muscular pain. By design, the RumbleRoller’s bumps are firmer than muscle tissue, but much softer than bone, so they deflect out of the way if they contact your spine or other bony protrusions. Everyone loves a good massage, but getting a professional massage every week can get pretty expensive pretty quickly. Plus, I’ve had a hard time finding a massage therapist that can give me a hard enough massage to really work the tight spots in my Scapular and Trapezius muscles. I’ve only been using the RumbleRoller for about 24 hours, but already I can feel how well it works. It is certainly a lot more painful than my other foam roller, which will take some getting used to. But wow, my shoulders feel so much better after rolling on it. It is a worthwhile investment. To put it into perspective, the cost of the RumbleRoller is less than a single massage therapy session. So, I’m pretty happy with it! Check it out at RumbleRoller.com to learn more, but you can also buy it on Amazon. This technique used by athletes and physical therapists to inhibit overactive muscles.